Suits tubes and pipes 6mm to 20mm (1/4″ to3/4″) dia. The MF20 micro flow switch is a super sensitive version of our popular P20 in line flow switch. The MF20 is a very simple and reliable mechanical flow switch that can detect extremely low flows; the switch can detect either continuous or pulsed flows. Typical applications include monitoring chemical metering pumps to ensure they are delivering flow, in water treatment, cooling towers and in a multitude of industrial processes. 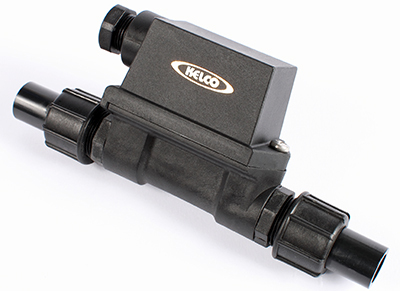 The MF20 flow switch gives a simple on or off response to liquid flow. There are no metal parts in contact with liquids within the switch, so the MF20 is ideal for use in aggressive media such as acids and alkali’s and many chemical solutions. The standard switch is supplied complete with tube flare fittings, for 3 popular tube sizes, and a set of pipe spigots and unions, for direct fitting into 15NB PVC or ABS pipe work. In addition, a number of electrical options are available. These include electrical modules with single and multiple reed switches, relays with various coil voltages, and solid-state switches.